. Famous Places of Edo and the Edo period . 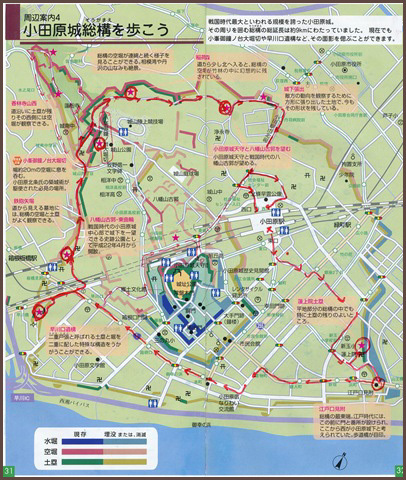 Sotobori street between Akasakamitsuke - Toranomon goes along Sotobori of Edo-jo Castle and trace of reservoir. Reservoir was used as water supply in the beginning in the early modern times. A part of the Sotobori stone wall is left in front of the Ministry of Education, Culture, Sports, Science and Technology yard and Toranomon Mitsui Building. Stone wall in front of Mitsui Building in particular is the only oar stand in Edo-jo Castle Sotobori. Stone wall left in the Ministry of Education, Culture, Sports, Science and Technology yard was copy of Sotobori which surrounded Edo-jo Castle and the Edo Shogunate mobilized daimyos of the whole country and built in (1636) for Kanei era 13 years. In Ministry of Education, Culture, Sports, Science and Technology, we stored stone wall based on excavation result with construction of central joint Government building Building No. 7 and established display corner where the total picture of stone wall found in in front of Ministry of Education, Culture, Sports, Science and Technology yard lounge and new Government building connecting walkway of subway Ginza Line Toranomon Station was seen.
. Edo Castle, Edo joo 江戸城 Edo-jo Castle . Most of the outer moats, Sotobori, were reclaimed by civil engineers of Tokyo local government after the Pacific war ended. They reclaimed the moats with debris of air raids piled up everywhere in Tokyo after the war and built highways or other facilities over them..
A part of the moat remains today between Ichigaya and Iidabashi and a road called Sotobori-dori runs along the moat with cherry trees planted along the roadside. In mid spring, you can see through the window of Chuo-sen train the cherry blossoms in full bloom and reflecting their images on the water of the moat. Tokugawa Ieyasu had learned about the importance of an outer moat during the siege of Odawara castle. He later applied this knowledge to the fortification of his own castle and town, Edo.
. . . . . During the Muromachi period, Odawara Castle had very strong defenses, as it was situated on a hill, surrounded by moats with water on the low side, and karahori 空堀 dry ditches on the hill side, with banks, walls and cliffs located all around the castle, enabling the defenders to repel attacks by the great warriors Uesugi Kenshin in 1561 and Takeda Shingen in 1569. However, during the Battle of Odawara in 1590, Toyotomi Hideyoshi forced the surrender of the Late Hōjō clan through a combination of a three-month siege and bluff. After ordering most of the fortifications destroyed, he awarded the holdings of the Late Hōjō to Tokugawa Ieyasu. Walking along the Sogamae fortifications ! When Edo Castle was built, the Tokugawa made use of the natural riverways to create part of the Outer Moat (sotobori). The Outer Moat begins around the Kiji Bridge in central Tokyo (Chiyoda-ku), follows part of the Nihonbashi River before cutting west and creating a spiral around to Iidabashi where it continues East until dumping into the Sumida RIver which finishes off the Sotobori when it flows into Tokyo Bay. Today the Kanda River flows from the northwest of Tokyo into the outer moat around Iidbashi and then on into the Sumida River. This section of the river from Iidabashi to the Sumida River is completely man made. The course of the river was redirected to create the outer moat. 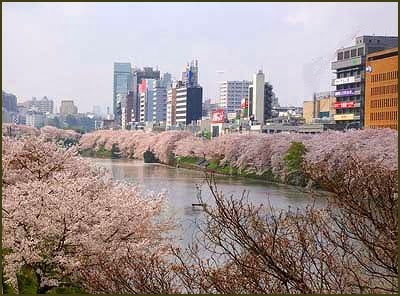 The original river flowed down past the castle to a point farther downriver on the Sumida River. This river is now called the Nihonbashi River and corresponds to the beginning of the Outer Moat spiral. Today it is actually connected to the Sotobori (Kanda River) at the original area in Iidabashi. That also makes it possible to travel from the Nihonbashi River to the Kanda River into the Sumida River and back again. 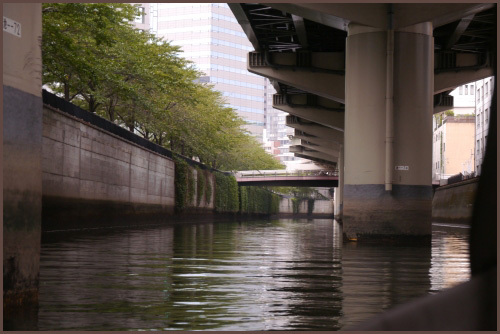 Thanks to the Consortium of Rediscovery Edo-Tokyo Walk you can take a cruise in a boat around these 3 sections of the former Sotobori. Along the way you can get some great close up views of the stone walls that are difficult to see from outside as they're hidden under the Shuto Expressway. You can find many kokuin (insignias) carved into the stones that are very difficult to see from outside without binoculars. Along the way the guide will show you Edo Period ukiyo-e prints to show what the river was like and talk about the Edo Period river culture. The tours are in Japanese only, but the cruise is enjoyable for anyone to view Tokyo from the waterways. 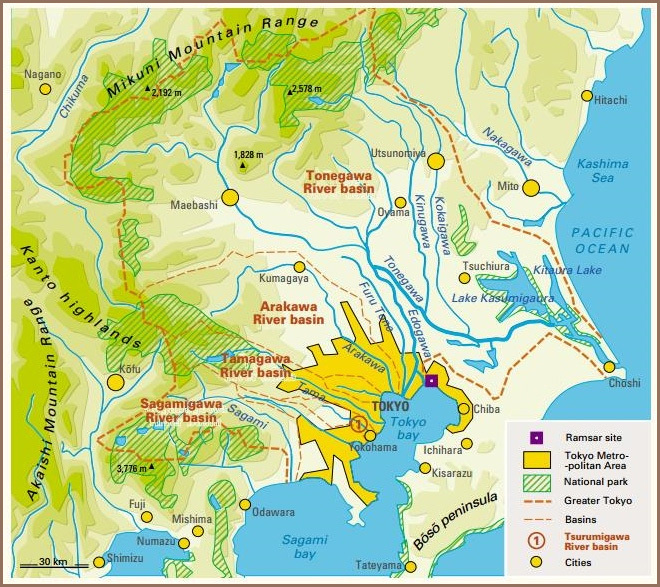 The purpose of this blog is to map and describe all of the rivers and streams in the Tokyo area. 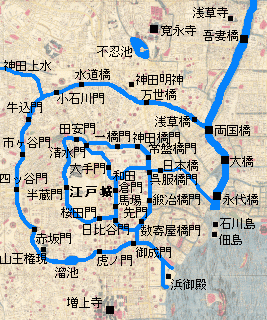 To guard against attacks on Edo Castle, a network of strategic moats, streams, and canals was laid out in a spiral pattern. Waterways for freight transport formed a vertical and horizontal grid. At the points of intersection between the roads and the waterways, bridges were built and short ferry routes called watashi ("crossings") were also developed. Because waterways and roads intersected in so many places, Edo had a huge number of bridges. At the time, Osaka was known as the "water city" because of its many bridges - about 200 in all - but Edo put the "water city" to shame with over 500 bridges. Landing points called kashi ("river banks") were established at various points along the waterways for unloading freight. Warehouses and markets were set up at the landing points, and these spots became hubs for the distribution of goods in Edo. The purpose of this study is to reveal the relationship between the urban structure and the waterway in Edo, the old Tokyo. 1) The city of Edo was expanded over the river by changing the route of river waters, and limiting the affected area during times of flooding. 2) The canals in the low city were used as water transport between the city and the farmlands. The urban design of the low city was closely related with the canals. 3) According to the drinking water way, there were some hierarchies between the city and the farming villages, warriors and merchants area, etc. 4) The sewerage was not so dirty, because it was consisted of rainwater and gray water. Rather, the sewerage had seemed as a charm against evil. Therefore the drainage channels were used as the boundary between residences, residence and street, towns, and town and farmland. 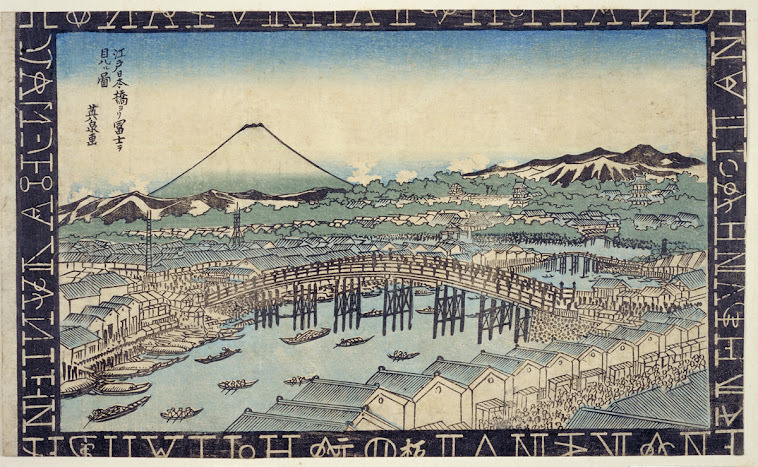 Not only Edo, but also many cities in the world were formed by relating with waterway. In these days, it is important that not only promoting some project of the waterway which is suited as the actual needs like attracting the tourist or creating the beautiful landscape of agriculture, but also rethinking about the waterway which has related with the urban structure or the lifestyle of the citizens in every city.
. 多摩川上水 Tamagawa Josui and 神田上水 Kanda Josui　.
. Horidomechoo 堀留町 Horidomecho District waterways . Nihonbashi - two Horidome rivers (east and west).
. Mita Yosui 三田用水 Mita Waterway and 三田上水 josui aqueduct .
. Tameike 赤坂溜池町 Akasaka Tameike district . This hokku is from the winter of 1792. Edo castle was renovated and expanded considerably after it was chosen as the site of the shogunate in the early 17th century. It already had a complex network of inner moats running through the core areas of the castle grounds, but to ensure safety the shogunate decided to add an outer moat as well and forced daimyo domain lords around the country to contribute the money, building materials, and workers the shogunate needed to construct the outer moat, which was 15 km (9.3 miles) long. The spacious area between the inner moats around the castle proper and the outer moat was used mainly for the mansions of various daimyo lords, who were required to stay in Edo in attendance on the shogun every other year. The moat itself, like the rest of the castle, was walled with massive pieces of carefully cut granite brought from great distances. The outer moat walls were so strong that some of them remain in fairly good condition even today after surviving US air raids in WW II and postwar city planning. In Issa's time commoners were allowed to go only as far as the outer side of the outer moat, part of which ran along the edge of a large park, so this is presumably where Issa is standing and looking at the clear, bright winter moon above. Its bright, hard light throws sharp shadows everywhere, and when the ice in the moat makes cracking sounds, moonlight, too, may synesthetically seem to be breaking up into solid pieces. In the silence the sounds of cracking ice must seem rather loud and penetrating to those near the moat. Is the moon's reflection dully visible on the ice on the moat, as if it had something to do with the cracking? Is Issa suggesting the shogunate itself, like the ice, is cracking apart (something that didn't finally happen until 1867)? There's nothing definite in the hokku to support these interpretations, but there's also nothing to rule them out. The photo at this link shows a portion of the outer moat that still remains in Hibiya Park near downtown Tokyo. In Issa's time the water level was of course much higher. The hokku is from the 10th month (November) of 1815, when Issa, living in his hometown, is back in greater Edo on a three-month visit. The hokku evokes the night of the first Day of the Wild Boar in the 10th month, the month governed by the wild boar according to Sino-Japanese zodiacal calendrical thought. On this day people of all classes eat special rice cakes believed to increase fertility and protect against disease. They also light hearths, ovens, leg and hand warmers, and other fires for winter and spring use. Edo castle uses the occasion to display of its power and magnificence by lighting large, bright bonfires in iron baskets hanging at key points in and around the castle and at the gates in the wall at the inner ends of two bridges that cross the outer moat. On a practical level, the bonfires are used to light the way for daimyo domain lords and shogunal officials who live outside the moat as they arrive at around sundown to attend an obligatory celebration in the castle on the night of the first Day of the Wild Boar. 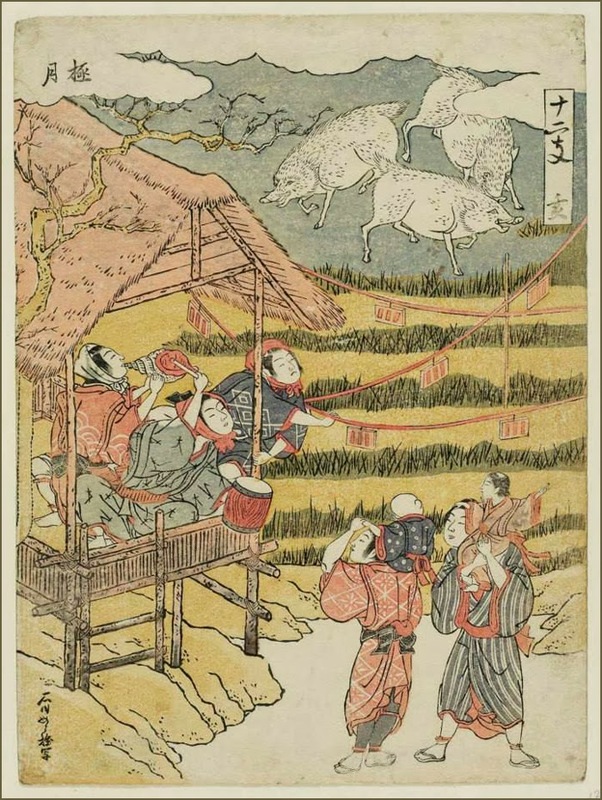 All daimyo lords and shogunal officials, including those who live inside the outer moat, are required to attend this celebration, during which they symbolically acknowledge their subservience and pledge once more their fealty to the shogun by accepting fancy rice cakes made from newly harvested rice. The lords and officials and their men are in their most formal clothes and closely follow strict protocol as they go through the gate. Both the lords and the hanging bonfires are imposing, yet there is something utterly serious and as cold as the November night about the whole scene. Issa, who must be standing outside the outer moat, seems to realize that the bonfires are as much for spectacle and for use in identifying each attendee at this mandatory event as they are for simple illumination and that this gravitas and well-lit formal precision are a consciously used image of power itself.
. kawa　江戸の川 -- 江戸の河 the rivers of Edo .